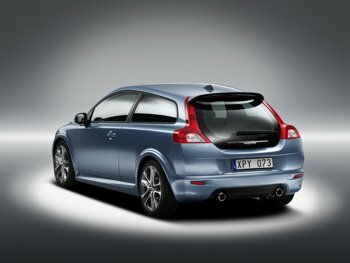 Launched in 2006, the new Volvo C30 is based on the Volvo SCC – a modern and exciting concept car that was unveiled in 2001. A true challenger in the compact car premium segment, the Volvo C30 displays clear elements of other classic Volvo models with a sporty emphasis – such as the Volvo 1800 ES. The Volvo C30 is a dynamic and functional two-door model that is tailormade for young, modern city dwellers with an active lifestyle. The Volvo C30 is equipped with basically the same safety systems and chassis characteristics as the Volvo S40 and V50. Examples include the crash safety structure and advanced suspension. The gently rounded front is provided with a special spoiler under the bumper that helps to reduce the risk of leg injuries to a pedestrian or cyclist if struck by the car. The Volvo C30 also comes with familiar Volvo safety features, such as side-impact protection (SIPS) and WHIPS (which helps to reduce the risk of whiplash injury in a rear-end collision). The car can also be equipped with Bi-Xenon type headlamps. The short overhang, the generous track width and the relatively long wheelbase contribute to handling of the very highest class. The Volvo C30 also offers a number of systems for greater personal security, such as Keyless Drive (which enables the car to be started without a key). Young, dynamic people with intense lives get "a Volvo of their own"